Moderate rain (total 10mm) heaviest on Fri night, then becoming colder with a dusting of snow on Fri night. Mild temperatures (max 7°C on Sun afternoon, min 1°C on Fri night). Winds decreasing (stormy winds from the WNW on Fri night, light winds from the SSW by Sun afternoon). Light rain (total 8mm), mostly falling on Mon morning. Mild temperatures (max 6°C on Mon afternoon, min 2°C on Wed night). Winds decreasing (fresh winds from the SSE on Mon night, calm by Wed morning). Light rain (total 2mm), mostly falling on Thu afternoon. Very mild (max 11°C on Sun afternoon, min 4°C on Thu night). Wind will be generally light. The weather forecast for Slieve Binnian is: Moderate rain (total 10mm) heaviest on Fri night, then becoming colder with a dusting of snow on Fri nightMild temperatures (max 7°C on Sun afternoon, min 1°C on Fri night)Winds decreasing (stormy winds from the WNW on Fri night, light winds from the SSW by Sun afternoon). Light rain (total 8mm), mostly falling on Mon morningMild temperatures (max 6°C on Mon afternoon, min 2°C on Wed night)Winds decreasing (fresh winds from the SSE on Mon night, calm by Wed morning). Light rain (total 2mm), mostly falling on Thu afternoonVery mild (max 11°C on Sun afternoon, min 4°C on Thu night)Wind will be generally light. This table gives the weather forecast for Slieve Binnian at the specific elevation of 747 m. Our advanced weather models allow us to provide distinct weather forecasts for several elevations of Slieve Binnian. To see the weather forecasts for the other elevations, use the tab navigation above the table. For a wider overview of the weather, consult the Weather Map of United Kingdom. * NOTE: not all weather observatories update at the same frequency which is the reason why some locations may show data from stations that are further away than known closer ones. 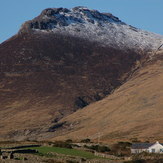 We also include passing Ship data if it is recorded close to Slieve Binnian and within an acceptable time window.